This summer we had the honor of meeting Yaacov Bergman! 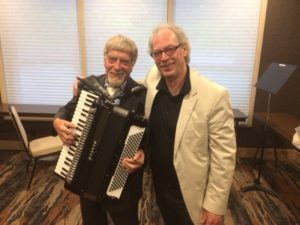 Maestro Bergman visited our studio to pick up an accordion for Pete Barbutti, who was to play for the Siletz Bay Music Festival at Gleneden Beach, OR. We presented Pete with our finest Petosa accordion. After the show was complete, Yaki relayed to us a comment from Pete: that we gave him the absolute best accordion with a true quality tone, and that he was very happy to play it! Maestro Bergman has conducted orchestras around the world, and is currently the music director / conductor of both the Walla Walla Symphony and the Portland Chamber Orchestra. Pete Barbutti is an American comedian who was born in 1934, and began learning accordion at age 11. He plays the accordion, piano, and the trumpet. Check out this video above of Pete Barbutti, “Moonlight in Vermont” 1978. He is very fun to watch!